Quoted price is for 2½ hours playing spread over 3 hour period. Simon Davies studied at both the Royal College of Music and the Royal Academy of Music before receiving his honours degree at the Royal Northern College of Music, Manchester. 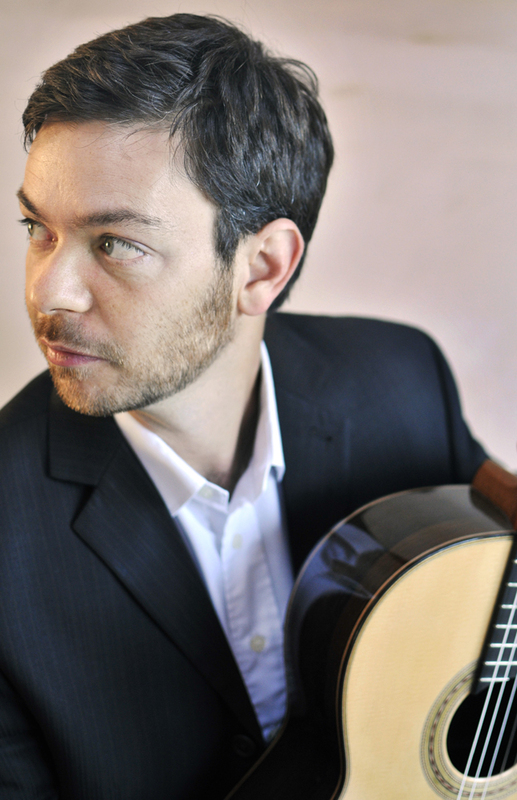 He is one half of The Arada Guitar Duo, whose recent release for Landor Records, ‘Mediterranean’ received glowing reviews from publications such as International Record Review and Gramophone magazine. The duo has also performed on BBC Radio 3 and Classic FM and in some of the country’s finest chamber music venues. Simon has performed in a number of Royal Shakespeare Company productions, appearing on stage in the West End run of “Romeo and Juliet” and the critically acclaimed “Venus & Adonis”. Simon is also a featured classical artist for Cunard, frequently appearing on the Queen Mary 2 liner. With 15 years experience of performing for corporate functions, parties and weddings, Simon is a sensitive and eclectic performer. His repertoire incorporates classical, Spanish, jazz, flamenco and popular styles. Recent venues where he has played have included; Tower Bridge, Tower of London, Claridges, The Waldorf, Natural History Museum, House of Lords, Salvador Dali Museum, Goodwood House, Blenheim Palace, Leeds Castle, Le Manoir aux Quat’ Saisons and Babington House. Simon usually plays for two-and-a-half hours over a three hour period. Simon Davies is based in Bedfordshire. See Pricing for details of travel costs, etc. "The comments we got from guests were really positive and we felt that Simon added a lot to the afternoon." "Simon was very good and created the perfect atmosphere for our evening." "Added to the atmosphere of our wedding reception. Good choice of music and would recommend to other people." "Simon was perfect for the type of evening our client wished for. Many thanks." This is just a selection from Simon’s repertoire. For clients who don't specify a type of music he usually includes a selection of classical, popular, Spanish, show tunes, etc. He can also adapt his programme to feature a specific type of music, eg: Spanish, South American, etc. The repertoire list is always expanding.